From Pharma to Table: Are Startups Really Fueling More Egalitarianism in Healthcare? Crowdfunding, crowdsourcing, and the lean go-get-'em startup attitude were all supposed to deliver more equality in pharmaceuticals, with people put in front of profits. This cynical what-passes-for-a-reporter asks, how we doin'? The Internet was supposed to be the great equalizer in oh so many ways. Everyone can make their voice heard, everyone can find their own community, everyone can be taken serious and ridicule everyone else with impunity. 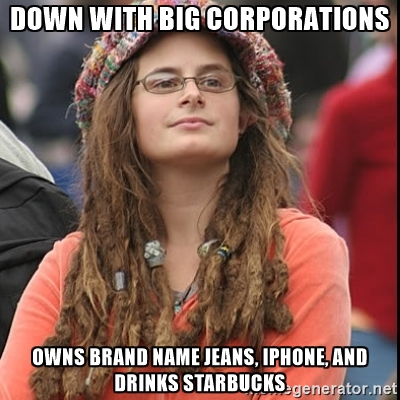 Startup culture was supposed to accomplish something similar in the business world, at least in the eyes of our increasingly socialist Millennial dreamers, with greater business opportunities for all, a marketplace for investors and for high-tech products that was more egalitarian, and rewards reaped by the public at large as well as the stakeholders. There’s been some success in that arena, what with the new Y-Combinator/Stanford-backed free online course for entrepreneurs and, er…robots that deliver beer? Uber? But startups, of course, are highly capitalist enterprises, backed by investors who want to see their money multiply exponentially and staffed by founders willing to risk millions of other people’s dollars. It’s the American way, fundamentally no different from traditional entrepreneurship, just on an accelerated timescale and built on a whole bunch of hopefully innovative intellectual property instead of any actual….what’s the word….capability. Which is why I didn’t have high expectations for any startup or emerging tech to lead to some great revolution in the pharmaceutical industry, any more than I did in the insurance and financial industries. Though there have been some whispers of crowdsourced protein-folding and other similar projects and advances, the pharmaceutical industry has remained predictably focused on developing the most profitable drugs they can identify, and of developing them in the most profitable ways. Digging into things a little, it looks like there are a few startups that really have managed to turn things on their head, at least a little. With more than $1 trillion in global sales, profit margins for established companies ranging from 20% to more than 50%, and super-high barriers to entry including resource intensity, technical skill and knowledge, and regulatory hurdles, pharma really isn’t ripe for disruption on a large scale. Some smaller companies are doing things with big differences, though—and others are hoping to get big doing the same old things, but better. What follows is a look at a handful of pharmaceutical companies meeting the egalitarian expectations of New Pharma with varying degrees of success. None of them are doing it alone—all are partnering with major research institutions and established Big Pharma companies. In fact, these partnerships are an essential part of the business model, and help explain why pharma tech has been so successful at innovating despite the high risks and profit demands of the industry. Source. Startups haven’t been the best at bringing drugs to market, but they’re playing a bigger role in getting new drugs in the pipeline. Many of today’s pharma startups are pinning their hopes on developing a cure for cancer—or at least a more efficient way to treat certain types of cancer. PMV Pharma falls into this camp, with its focus on the p53 protein that is miscoded in at least 50% of human cancer tumors. Founded by one of the research scientists who first discovered the p53 protein, PMV raised $30 million in a Series A round in 2014, and an additional $74 million in a Series B round announced just last month. Right now, the company has several drugs candidates in development, and there’s no telling when they’ll have one ready for clinical trials. This is one of the big problems with pharmaceutical startups: it can take years for a company to develop even one drug viable enough for clinical trials, and the trials themselves will take more years and more millions of dollars. Investors have to be willing to sit tight and wait a decade or more for a payoff that might never come. This is also why startups are necessary. Big Pharma isn’t going to take resources away from the R&D they’re already engaged in to spend a decade developing a brand new approach to cancer treatments, especially when that approach might not pay off. It’s likely that PMV will be sold or will license its drugs to a larger company when they’re closer to clinical trials, letting Big Pharma take the drug(s) the last few miles to market and sharing in the profits. Are better cancer drugs a good thing for everybody? Sure. And is the startup environment necessary for the innovation we’re seeing at PMV Pharma? Sure. But are they changing the pharmaceutical industry? Not radically. They’re just the outsourced research arm for some future pharma conglomerate: if they succeed, they get bought out, and if they fail, everybody but Big Pharma loses. It’s like a fairy tale for post-industrial capitalists. The same business model is being paired with different attempts at cancer cures and treatments over at Oncolinx, which won the $1 million dollar grand prize at this year’s 43North competition. They’re working on a drug-delivery agent that will help chemotherapy drugs target cancerous cells and ignore healthy tissue, making the treatments safer and more bearable while also improving their efficacy and cost-effectiveness. That $1 million prize seems to be the company’s only funding, though, and one has to wonder how far it will take them in the pharmaceutical world. If their research pays off, they’ll certainly be able to secure more cash from investors, but given the mechanism of their cancer innovation they’re even more likely to be partnered with—or owned by—an existing pharmaceutical giant by the time they reach the market. A chemo drug manufacturer will snap them up the minute they have a verifiably improved delivery mechanism. Again, the only increase to egalitarianism here is the cheaper and better cancer treatment that may come along once the research is complete. In terms of shaking up the business of saving lives, though, there’s nothing here that qualifies as disruptive. The same could be said for Xtuit (focusing on the “tumor microenvironment;” $4 million in initial funding in 2014 and a $22 million Series A round in 2015), and several other startups taking the same approach. Instead of developing new drugs from the ground up that are likely to be sold off to Big Pharma, Regnix is one of a handful of startups taking the opposite approach. This company also focused on a cancer treatment, but a drug called RGX-104 from GlaxoSmithKline after the pharma giant decided its development was too expensive. With $10 million raised in a Series A round in 2015 and another $33 million in last year’s Series B, Regenix is bringing a version of the drug into clinical trials. If it proves effective and safe enough, GSK will get a big cut of any profits, in a reverse of the usual pharma startup licensing scheme: instead of paying top-dollar for the drug up front, Rgenix bought RGX-104 for a song and will cough up big dough on the backend. So Big Pharma already got paid millions for something they gave up on, and they’ll get paid millions more if Rgenix’s research goes anywhere. A nifty twist on the model, but I still don’t see any revolution for the little guy. Enter Perlara, a unique pharma startup that’s tackling diseases too rare for Big Pharma to care about, in a way that might actually make money and save kids’ lives. One day. The idea is data science/machine learning/other AI-type things I don’t understand being used to make custom drugs for rare genetic disorders (and eventually maybe other diseases, too). Using live populations of yeasts, worms, fish, and sometimes mice, Perlara uses CRISPR to alter its subjects’ genetics and mimic the human genetic disorders it’s trying to treat. It can then run thousands of real-world tests and simulations with thousands of different drugs and molecules to see what effects are produced. When it finds something promising, the tests and the drugs can be refined and run over and over again. The ultimate goal is finding the perfect drug to treat an individual case of a singular disorder, with ever-improving understandings of drug mechanisms and genetic interactions along the way. A modest $2 million seed round for what was then called Perlstein Lab was completed in 2014, and since then Perlara has gone through the Y Combinator accelerator and inked a deal with another Big Pharma player, Novartis, which will likely bring the first of Perlara’s drugs to market. The pact with Big Pharma is crucial to Perlara’s success, which is explicitly geared towards achieving economies of scale in research and development so small-batch manufacturing can be implemented by larger companies with minimal risk. This is the kind of innovation I am always hoping to find and doubting I will. Other companies, notably AtomWise and Recursion Pharmaceuticals, are also using machine learning and Big Data to sift through drug potentials and make development cheaper and more effective. We’ll have to wait and see if their innovations will help to revolutionize a pharmaceutical industry that’s relatively stuck in its ways and happily collecting the cash those ways bring in. If they are not bringing the best drugs to the market, what are they doing? Also, if the best drug is not coming from them, but being approved what does that say about the approval process? I am not sure why the FDA would approve a new drug if it is not the best option for the patient. 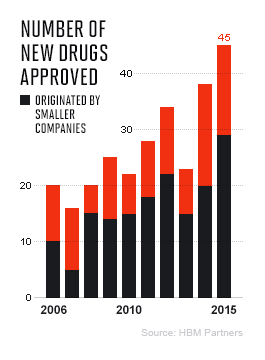 I wonder why so many more new drugs have been approved in the last couple of years? That is a curiosity here that should be analyzed a bit more. I do not think that just because there are pharma startups that drugs coming from them are better or should just be “approved”. I wonder. So much funding for companies that are just starting out and having trouble getting the job done, like you said. You have to wonder about the investors and what they really expect from funding a company like this. The drug companies, startup or otherwise, are in it for the money. What are they going to change when there are still people getting prescribed drugs they do not need or being addicted to others that helped a short while and led to other drug addictions? I will be shocked the day the pharma companies are put on hold.